The weeks flash by and the CHAOS creatives meet up comes round again. As you probably remember, we have started alternating morning and evening meets to make the sessions accessible to as many people as possible. This time its MORNING – Monday 7 November 9am to 10.30 ish at Mettricks, Guildhall Square, Southampton. Map here for parking etc. 10 chaos points for you if you chipped in. A quick summary of your feedback is that the overall the document has very strong approval from you – average 80% thumbs up across the 5 questions. 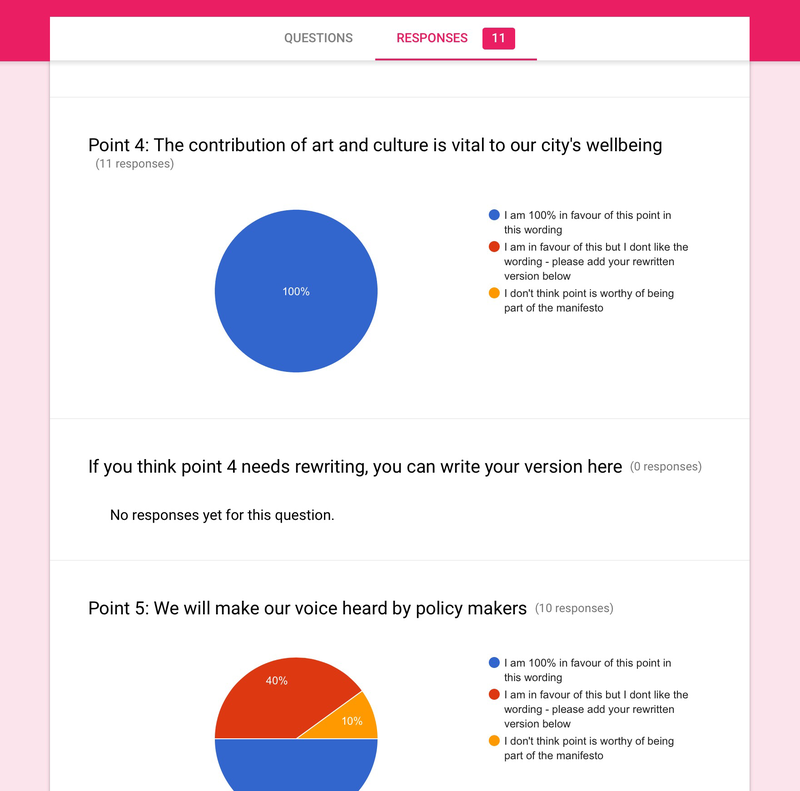 Contributors posed some challenging questions which editors will now thrash out in order to finalise the five points. The goal is to get the finalised CHAOS Manifesto out in time for our next met up on Monday 7 November. Fingers crossed! TLDR: Mayflower and CHAOS want to be friends. We are thinking about how we might make that work for all of us. Catherine from CHAOS HQ reports on an interesting meeting she has had with a large local arts organisation as part of our strategy of growing the connections and influence of our network. “I had a meeting with Sara Scott, Head of Outreach at Mayflower to catch her up on CHAOS developments. She has a new post as head of a beefed up team which should be good news for local creators. She was aware of our activity in seeking to grow CHAOS and welcomed a united voice for city creators. We chatted about the organisation Art at the Heart. It was interesting to learn that it continues to meet – I had assumed it had fallen by the wayside. Sara explained that having reviewed its purpose after the “Playing Field” initiative a few years ago, AATH members decided that it continues to be a useful network for larger arts organisations in the city and not just those connected to Guildhall square. They intend to carry on working together on projects to benefit the whole city and excitingly, are keen to find ways of having a formal relationship with CHAOS. Your CHAOS HQ team will discuss this opportunity in the next couple of months and if you have thoughts about the pros/cons of such an initiative, please make sure you share them. As a measure of Mayflower’s partnership approach, they sent a member of their outreach team to a recent CHAOS meet up. This was a thoughtful move on their part to build connections. Sara told me that other members of the theatre’s team will be coming to future meetings. This seems like a great model for forging links between CHAOS members and other local producer/employer organisations. Perhaps we should encourage other local arts and culture organisations to do the same? We also talked about the idea of shared an idea of a Young CHAOS: a bunch of specialist services and support for Southampton’s young creators. ‘Young people’ is often used as shorthand for graduates. We have thousands of 16-21s involved in youth theatres, music groups, dance groups etc. A voice speaking up for them could do great things. The next chaos meet up is on Monday 7 November 2016 at 9am. Venue tbc. TLDR: CHAOS steering group has sent a letter (well, an email actually) to the Board and outgoing Chair of Southampton Cultural Development Trust, John Denham, outlining CHAOS plans for growth and asking for more transparency and consultation in the development of cultural policy for the city. Full text of the letter is here. We will let you know what response comes back. There have been some changes recently in the focus of CHAOS which we would like to share with Southampton Culture Development Trust. CHAOS was formed 5 years ago as a networking organisation for “culture, heritage + arts organisations” in Southampton. CHAOS organises popular & valued monthly networking meet ups, but we want to do more. Reviewing the make up of our 400+ strong membership, we conclude that our members comprise mainly “the creators” from a wide range of local artistic and cultural communities; artists, musicians, crafters, designers, performers etc. This group will be our focus going forward. We have formed a steering group who are working on behalf of the membership to establish the structures and systems we need to operate as a representative body. We have added the In Conversation series of public talks with local creators to our offer and are currently consulting on a portfolio of events & services to benefit members and the wider creative scene. We know that artists and other creatives can offer a kind of insight and reflection to our city that no other group can. We are needed to support the delivery of community cohesion, city pride, economic development, improvements in public health and other city objectives through our individual and collective practice and as partners alongside other interest groups. CHAOS is pleased to offer ourselves as a source of insight, project partners and a conduit for information about what Southampton artists and other creatives are doing and thinking. Listening to our members who observe and work in the local, regional, national and international cultural scene, there is a growing call for clear and timely information about and access to initiatives and projects relating to art and culture in the city. We also perceive a mismatch between city policy makers’ statements of welcoming & championing culture and relationships with the city’s own creative communities. We believe that creators’ voices are not currently being heard loudly enough in envisioning the city’s strategic planning. This is especially felt in the area of developing arts/culture strategic vision or identifying & delivering arts/culture projects. act as a key representative body for arts and culture communities in the City. brief the new SCDT Chair on the local art and culture scene. We would like to discuss SCDTs arrangements for consultation and communication with the city’s creative communities going forward. It is an exciting time for art and culture in Southampton. We are enjoying the benefits of significant investment from the Arts Council and others. This is, however, coming at a time of significant challenges in the face of reduced public spending. We look forward to making our contribution to ensuring that the significant investment of skill, time and money benefits the city and all its communities providing maximum sustained impact into the years ahead. The CHAOS steering group of Ben, Catherine, Charlie, Christina and Matt have drafted a 5 point manifesto which is now out for consultation. It has been sent out to all members by email and we are reposting it regulary on Facebook and twitter to try and get the widest response. A cut off date of 23 October has been set which means the final version will be launched to the members at the November 7th meet up and shared with policy makers and other organisations directly afterwards. Members who have contacts with organisations or key individuals who they believe should be made aware of CHAOS manifesto once it is finalised are needed to ensure our message is received in all the right places. Please share your information for the benefit of the network (within the terms if your own data protection artangements, of course) by contributing when data collection happens in the coming weeks. Hello! This is a starter website for CHAOS – Southampton UKs network for creative people. CHAOS is growing and soon we hope to have a website packed with info and services for Southampton’s creative communities. Already you can find out here about our regular monthly meet ups, our In Conversation series of talks with local creators and importantly, you can contribute to consultations about how we go forward together. In the mean time, here’s a picture of Foxes who is from Southampton. We love you Foxes!